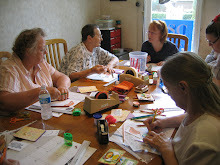 Participants will make 2 Christmas cards and 2 tags using various techniques and materials, including colored pencils, stickles and glossy accents. There will be several projects to choose from so there will be something appealing for everyone. Bag Lunch (12:00-1:00) is included.